This file photo taken on June 27, 2016 at the Museum of the Army - Musee de l' Armee at the Hotel des Invalides in Paris shows people restoring Vizir, the last horse of Napoleon Bonaparte the Ist. Visitors to the Army Museum in Paris are being treated to the rare sight of two taxidermists at work restoring a stuffed horse -- the last one ridden by Napoleon Bonaparte. "Le Vizir" is a little worse for wear more than 200 years after carrying the emperor to victory against the Prussians and the Russians -- not to mention being stuffed not just once, but twice. FRANCOIS GUILLOT / AFP. 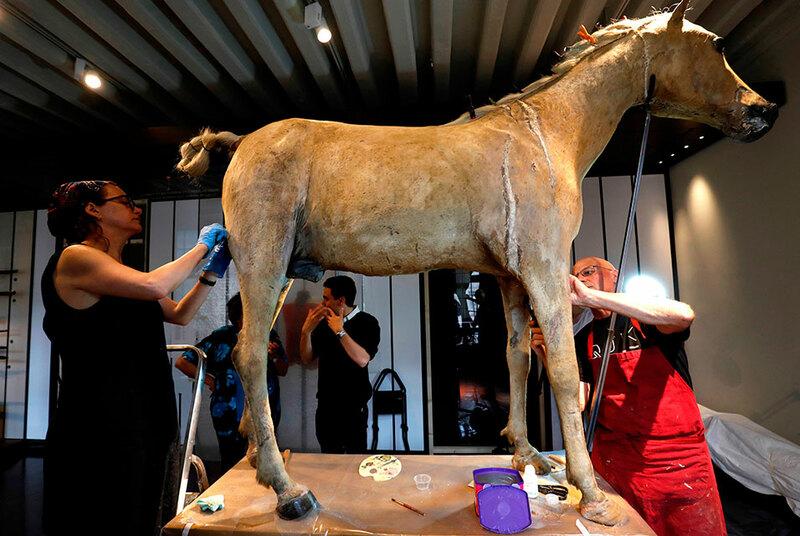 PARIS (AFP).- Visitors to the Army Museum in Paris are being treated to the rare sight of two taxidermists at work restoring a stuffed horse -- the last one ridden by Napoleon Bonaparte.